Q was the ‘toon who was never supposed to be. He was originally going to be a disembodied voice, always making commentary off-screen. That proved problematic, for a variety of reasons. So then we borrowed the Agent S character from a different comic (talk to Codex! 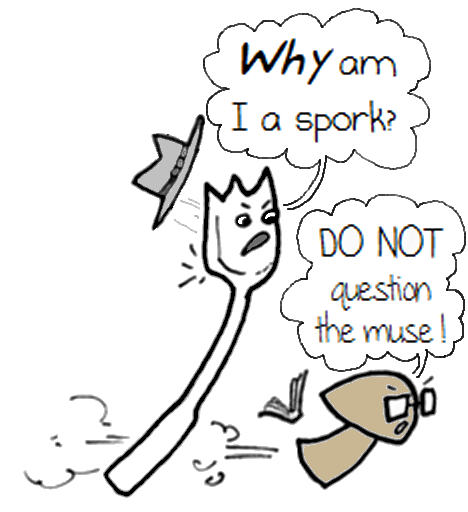 ), who was a spoon with a hat. That was far too boring. Every third comic has a spoon for a character. Or a fork. In fact, the original plan was to let the world think Q was a spoon, only to reveal at a later time that he was, in fact, a spork. Mistakes were made, strips were drawn, someone forgot to let someone else edit early enough in the process, and the secret was out. Meh. Codex demanded some answers to pressing viewer questions. Why do you wear a hat? It’s a fedora. It keeps my tines warm. Why did you decide to do a comic? It was either this or a job in the fast food industry. Fewer folks lick me as a cartoonist. Do you have a backstory? Absolutely. All quality comic strip characters have a backstory. Do you have a favorite Tempest in a Teardrop character? That is like picking your favorite child! So, obviously and without hesitation, it’s The Germ. Which comic strip is your favorite? Tomorrow’s strip will be the second appearance of The Germ. It is my favorite strip. As a bonus, one of the problems in perspective helped Codex discover some colorful new adjectives! What is your favorite book? In the science fiction & fantasy genre, we are talking the Mistborn series. I am told <cough> I am wrong, but I do not care. What did you think of Interstellar? I cannot say. No, really. What I want to say is too great of a line to waste here, when it will instead be said by a new character we’ll be introducing in August. Imagine something pithy, derogatory, and inappropriate; you have the gist. I’m sure you’ve seen plenty of examples on the internet. Much better use for a spork than what was intended. Someone needs to invent a product uniquely suited to spork or spork-like utensils. Then we will get the respect we deserve! I have a feeling that would not be something you’d want to eat.